A dental implant replaces a missing tooth. In this procedure, a small titanium post is surgically implanted into the bone by an oral surgeon. Once set, we can then attach a replacement tooth onto the top of the post, such as a crown or bridge. Patients are always sedated for the utmost comfort, although some pain is associated with the procedure and will subside in a few days. Depending on the location of the affected tooth, the implant process can take as little as three months or up to a year. It is normal for the implant to feel more solid than your regular tooth because it is integrated into the bone. 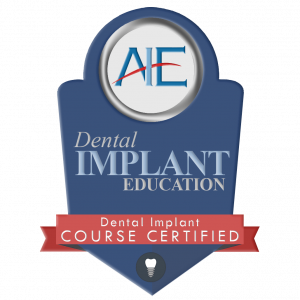 Our implants will last forever, but proper oral care is required to maintain the implant. Dental crowns cover an entire tooth that is too damaged to be fixed with a filling. A crown may be recommended to protect a weak tooth from fracturing, restore a tooth that is already fractured or replace a large filling. With the help of Cerec technologies, our office can provide same-day permanent crowns that match your tooth shade for a natural look and feel. Most crown appointments will not create any discomfort during or after the procedure and only takes slightly longer than a regular filling. Even with a crown, teeth are still prone to decay so regular at-home cleaning and bi-annual appointments are necessary. Our crowns can last up to 20 years with good oral hygiene. Dentures replace teeth that are loose or have been lost due to bone loss. Depending on the number of teeth lost, partial or complete dentures can be provided. We provide a multi-step process that minimizes time without your teeth and offer the best end result. With proper adjustments, most patients regain most normal eating habits. We have a several step process of creating your dentures which means we cannot provide same-day products, but you will have the best end result. We minimalize, and sometimes eliminate, time without your teeth, but results vary with each case. Our offices will provide a case to soak your dentures in overnight, as regular brushing can damage them. We also recommend that patients do not sleep in their dentures to ensure that gum tissue can rest and avoid infection. With proper care, our dentures can last up to 10 years, but we recommend regular annual appointments to check gum health and oral screenings. A root canal treatment is necessary when the soft tissue inside of the tooth becomes inflamed or infected. Patients may feel pain around the tooth, prolonged sensitivity, tenderness, or swelling. While most patients feel little to no pain during the procedure, it is normal to feel soreness after. However, the longer the infection sits in the tooth untreated, the more likely it is to feel discomfort after. Most cases can be done in our offices and take 30 minutes to 2 hours depending on the amount of infection within the tooth and the location of the tooth. Severe cases may need to be sent to an endodontist who specialized in root canal treatments. We recommend regular dental appointments to ensure good oral health and prevent future infections. Dental bridges are used to replace one or more missing teeth. Bridges span the space, where the teeth are missing, with adjoined crowns. The bridge is cemented into place so unlike dentures, it is a permanent option. Patients will be desensitized for the upmost comfort and appointments typically last less than two hours. However, it is normal to feel sore after. The bridge will match your tooth shade for a natural look and feel and can last up to 20 years with proper home care. Bridges and implants can serve similar purposes so always consult your dental physician about what procedure fits your needs best. This video shows you how a bridge replaces a missing tooth, using traditional dental impressions to create a custom-made restoration. The American Dental Association states that teeth are usually removed due to trauma, infection or crowding. If a tooth cannot be repaired by a filling or crown, an extraction may be recommended. Similarly, wisdom teeth are often removed due to overcrowding. Our office can provide both simple and surgical extractions. Extractions always use local anesthesia and desensitizing the area. Most patients are given pain medicine to manage discomfort after the procedure, but it’s normal to feel pressure or soreness. Healing time typically takes 6 weeks and we recommend avoiding heavy lifting or excessive exercise in the days following. Slight bleeding is expected after removing a tooth, but gauze will be placed to help manage. If heavy bleeding continues, contact our office immediately. We do not recommend smoking for two weeks after the procedure so the wound can fully heal. Tobacco can cause dry sockets which are more painful than the original toothache.